Have you flogged your sweetie with a strip of fresh goatskin, yet, today? If not, you’d better get after it! Today’s Lupercalia, and time’s a-wastin’! At this time many of the noble youths and of the magistrates run up and down through the city naked, for sport and laughter striking those they meet with shaggy thongs. And many women of rank also purposely get in their way, and like children at school present their hands to be struck, believing that the pregnant will thus be helped in delivery, and the barren to pregnancy. 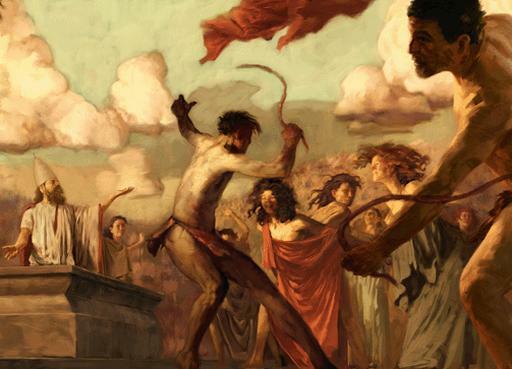 The ceremonies were presided over by the Luperci, goatskin-wearing priests of Lupercus (also called Faunus), who sacrificed a dog and two billy goats and anointed younger priests with the blood. After the sacrificial feast the Luperci would cut rough strips from the skins of the sacrificed goats and then young men of the equestrian and senatorial classes would run around the Palatine Hill swinging these makeshift lashes; girls and young women would line up along the parade route because it was believed that being struck by the whips conferred a blessing which would ensure fertility and ease the pains of childbirth. This popular celebration was eventually abandoned by the upper classes around the time of Julius Caesar, but it remained popular with the lower classes into Christian times until its observance was banned by Pope Gelasius I in 496. I am guessing they presented the fleshy part of the palm, at the base of the palm of the hand, to be struck, rather than be struck on the fingers. I wonder if any youth was observant enough to notice the occasional woman whose smile in silence and gleam in her eye indicated she was receptive to much more from the whip than a slap on the hand. Such a woman would be good to meet later with, in private.